There’s a lull in this period while the world builds up to the war between the dwarves and the Najar. Nothing spectacular. 229 NA: The Elves constructed a fleet at Shianosoth. After only a few decades of practicing enchantment and protection magic, the Elves perfected the art. Perhaps this was due to their long lifespans. The first Elves that came into being so long ago were still alive and young. 241 NA: Decadence continued to sit well with the Najar. They traded with the islands in the Maw for exotic goods filtering up from the Elven forests in the south. With a growing population, the Najaran Empire ebbed outward, adding the city of Cynelle on the point of the continent, at the southwestern end of the Red Peaks. 245 NA: In the east the Najar built the city of Hykma at the tip of the Mandibles. 250 NA: The Grez have always had the most advanced civilization in ice magic. The Grez froze the Cold Woods creating an icy path up to Najar. The wraiths built a new city in the center of the frosty forest, Ksilartlu. They then assembled an army in Ksilartlu. 268 NA:With the Grez slowly advancing towards Najar territory, the slow cogs of the great Najaran war machine began to grind into motion. The Najar domesticated horses in the eastern plains and become well educated in the art of cavalry. The Najar archer contingents practiced for years in the vast forests, perfecting their skills. 279 NA: The Merfolk built an army in Drolfo’s Cove and Drolfo commanded them to build a trading fleet. To protect their fleets from Bwarlor pirate attacks the Merfolk learned the art of naval warfare. 283 NA: The Merfolk built a city off Kidney Island by the name of New Tortuga. The unrest in Ukraine has been going on about since I started this blog, but I have yet to post on it. Part of my reason for not posting is because I don’t know much about whats going on there. I feel like the topic deserves to be addressed regardless. I’ll try to start from the top and see where that leads me. In February the people in Crimea, the section of Ukraine that extends into the Black Sea, decided they wanted to stop being part of Ukraine and start being a part of Russia. Did they decide this on their own or did the Russians threaten them? I don’t know. The Russians sent in their army and took over Crimea. Within the next few months other parts of Ukraine started deciding they wanted to stop being part of Ukraine and start being part of Russia. Again, its unclear if this was what the people in those areas want or if Russia is intimidating them. Outside of Crimea, Russia appears to not be directly involved in hostile takeovers of government entities. If the people of eastern Ukraine want to join Russia then it makes perfect sense that they would be speaking Russian and using Russian weapons. But what if the people taking over government buildings in Ukraine are Russian soldiers disguised as Ukrainians? It seemed plausible until I considered accents. That accent would be noticed by the civilians and reporters in Ukraine, but so far I haven’t heard anyone mentioning it. That means that people aren’t paying enough attention or that the accent fits with the local accents, indicating that the rebels are actually Ukrainians who want to join Russia. Or my theory is wrong. One of my other theories is that if Russia is aiding the rebels, then the CIA would almost definitely know about it. That’s the exact sort of thing the CIA should be trying to find out and considering they were able to find Osama Bin Laden, I wouldn’t be surprised if they found out where the Ukrainian rebels’ weapons came from. But is it bad if Russian aids one side of a civil war whose outcome directly affects their country? The war is having bad effects on the rest of the world. 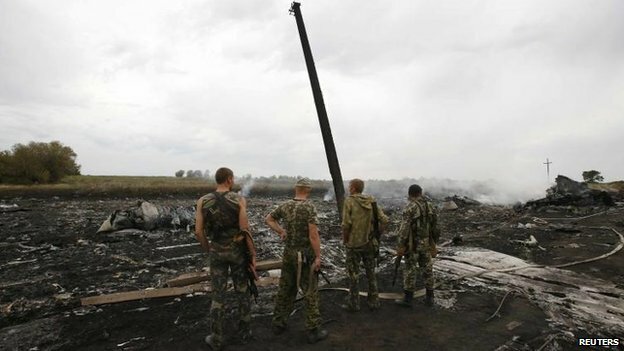 For example, the above picture that I took from the BBC’s website shows the wreckage caused by the Malaysian plane shot down over Ukraine. It’s unclear right now who shot it down. Was it rebels? The Ukrainian government? The Russian government? A random lunatic? My wife said that one Russian news network is claiming the western world created a conspiracy with the plane going down. The network claims that the western world filled a plane with passengers who were already dead. The two pilots parachuted out and the plane crashed. There was no missile that shot it down. That makes me think that Russia must not have as strict laws on truthful reporting of the news as the USA does. That covers most of the actual events. The rest of the unrest in Ukraine has been officials talking, but I doubt the actual people in eastern Ukraine are listening. It seems like a war will be inevitable, but its not there yet. This post shows the beginnings of some benefits Navillus brings. Worshiping a demon prince has some negative effects (human sacrifice), but there are positives in Gurutama as well. Navillus truly does care about the development of children within his domain, so he ordered an educational system built. One of the ways we’re going to reflect this using the game rules is that nearly every Najaran Human will be literate. They learned the basics in the public school system. Something unknown in the similar real world epoch of the Medieval Age. 134 NA: The Dwarves sent a missionary group to the Elves. 138 NA: The Elves responded positively after an Elven embassy to the Metal Tiers was shown the words of the Holy Books of Dwarven Legend. However, the Elves were not warriors. They would do their best to create the weapons, armor, and ships for protecting the world, but they would not fight directly. The Dwarves equipped another army in the Metal Tiers. 142 NA: The Dwarves sent a missionary group to the Grez as well. 147 NA: The Grez agreed to the alliance terms, but preferred to work separately from the other members. 151 NA: The Elves built a port city, Shianosoth, to begin exporting their new products. The infancy of the Elven race necessitates the building of a great deal of infrastructure before a war with Najar can begin. 172 NA: The Najar settled into prosperity. A strict hierarchy brought order and peace to their fertile lands. The ports of Alixria and Alrdia began trade with the Merfolk and sent ships even as far as Hearthland to trade with the settlers in the Green River Valley. Plantations began to spring up in the Great Valley below the Red Peaks. It was a good time to be a Najaran citizen and in the interest of expansion, the empire begins to open its borders to other species (NOT the Bwarlor). The radiant holiness of Navillus continued to shine on his people, driving them onward in the pursuit of knowledge and power. A public education system was created for all Najaran children. 177 NA: Conflicts began to escalate amongst the Bwarlor and the fish-folk and soon the Humans were forced to rethink their strategies… But they were fast learners and they took to their oceanic home with great glee! Bwarlor pirates covered the sea as they used to cover the Najar Valley before the coming of the Immolation. 194 NA: Rumors of a creeping cold began to infiltrate the Najaran Empire. Many dismissed the rumors as merely stories to frighten children and others took comfort knowing that the flames of Navillus would melt any approaching cold… Nevertheless the Brotherhood of Living Immolation, which had thoroughly infiltrated the highest ranks of the Empire, was less optimistic. They heard Navillus whispering to them in the darkness below the fiery heart of the Red Peaks and knew of the dread-ice gathering in the frozen North. Giving my standard Rogue deck a try against Maexxna and failing miserably. 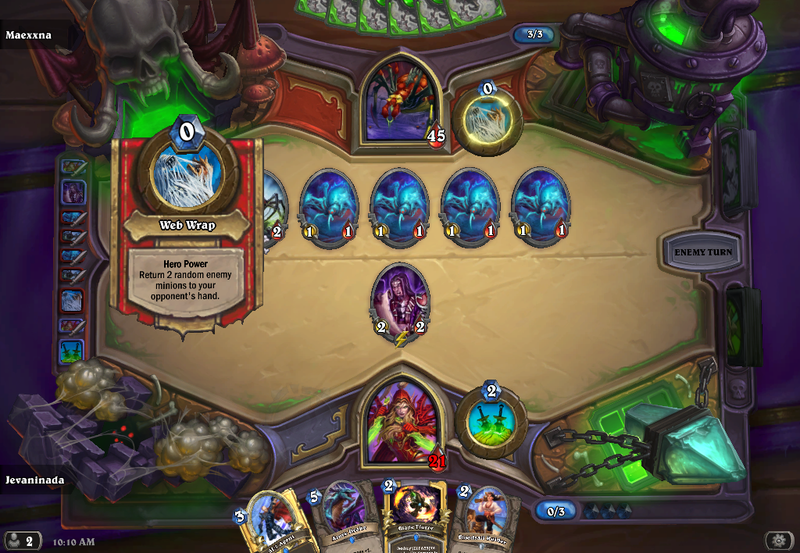 I’ve been playing around with beating the Heroic version of one boss in Hearthstone’s Curse of Naxxramas. The boss is called Maexxna and she is a giant spider. The normal version was easy to beat, but the Heroic version is way harder. She starts off with effectively three spider minions to your zero. Plus, if you kill one of those minions they turn into two other spiders. She also has an ability she can use every turn for free to throw two of your minions back to your hand. The best way to beat her seems obvious for Hearthstone veterans, play a deck with a bunch of minions that have effects when they’re played from your hand. For example, there’s one minion that deals 1 damage when it is played. She returns it, but then you get the free damage once again! There’s another few that heal you up. Play one of those every turn and she can’t bring you down as quickly. Maexxna has a tendency to flood her side of the board with her weak spider minions. She can only have seven total and there’s a way to take advantage of this as well. The best strategy I’ve heard so far is to play a minion who restores six life every turn. If Maexxna’s board is filled with seven minions that can each only deal one damage, then you’re only taking one damage per turn total. Then you play a minion that can attack on its first turn to deal 4 damage to Maexxna directly. So once you get to that point in the game you’re only taking 1 damage for every 4 damage Maexxna takes. I haven’t tried that deck yet and I’m it takes a bit of luck and skill to succeed with it. Given enough time I’m sure I can manage it. There’s still a lot more bosses to go after Maexxna though! I’ll be looking forward to them after my vacation. EDIT: I did the strategy I talked about above and it worked perfectly. Give it a shot with Paladin if you’re having trouble with her! A Google Earth view of Bois Blanc Island (Pronounced Bob-Lo Island). I left this morning for a week long vacation in Michigan. I’ve set up the site to update while I’m gone. When I get back I will undoubtedly be posting about what my trip was like. Consider this a heads-up that if anything strange develops on the site I won’t be able to fix it until I return. Picture above are three islands in Lake Huron, north of Michigan. Michigan is split into two distinct parts, the Upper Peninsula and the Lower Peninsula. When you look at a map, the Lower Peninsula is the section that looks like a left handed oven mitt. The Upper Peninsula looks like a broken branch or something. Anyways, those three islands are almost right between the closest points of the peninsulas. You can see the bridge to the left of the islands in the picture. 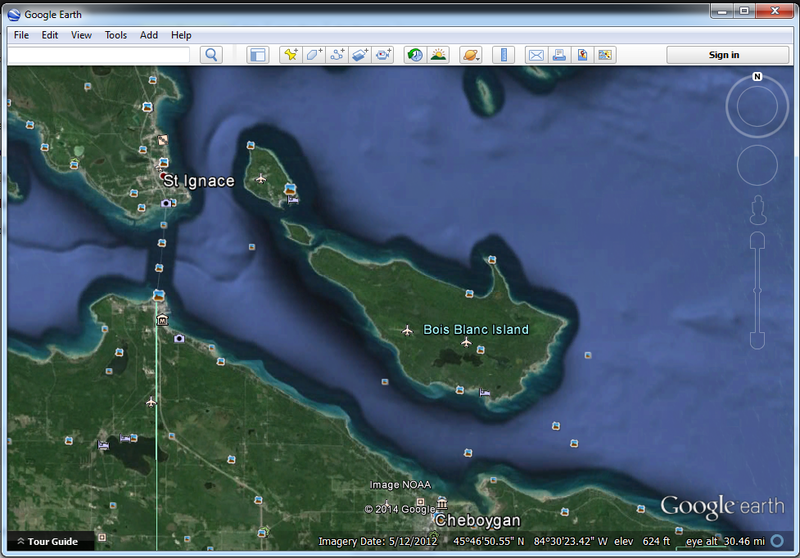 I’m going to Bois Blanc Island (Bob-Lo), the lower right one, for my vacation. The top left island is called Mackinac Island (Mac-in-aw). The middle island is called Round Island. Historically, Mackinac Island is the most important. It contains a fort built by the British to trade for furs with the local Native Americans. The fort was given to the USA after the Revolutionary War, but many British stuck around. In the War of 1812, the British retook the fort, but they had to give it back at the end of the war once again. The other two islands can’t compete with the “staggering historical importance” of Mackinac Island. Today, Mackinac is a tourist location reached by ferry, boat, or private airplane. It has tons of candy shops, toy shops, and fudge shops. Fudge is the biggest export from Mackinac. The island also boasts the hotel with the largest porch in the world. You can also visit the old fort and a butterfly zoo while you’re on Mackinac. No cars are allowed on Mackinac, so you have to get around by walking, biking, or horses. Round Island is a national park with nothing on it except trees, rocks, animals, and a lighthouse. It has never had any historical importance whatsoever and it is not strictly round. Bois Blanc Island is pronounced Bob-Lo Island. REMEMBER HOW TO PRONOUNCE IT! Bois Blanc was a timber resource for the US navy back when ships were still primarily built out of wood. The navy started selling plots of land on Bois Blanc after they realized they didn’t need the wood anymore. The plots were bought by people to construct beachfront summer homes in the 1880s. My dad’s mom’s mom’s dad (I think I got that right) was one of the people who bought a plot of land. My great-great-grandpa built a cottage on the island and now all of his descendants go there for vacations. For the next week I will be on Bois Blanc Island with my extended relatives, far away from the rest of the world. I was playing Spore around the time we were playing this part of Dawn of Worlds. In Spore you can defeat other nations by fighting them or by converting them to your cause. I tried to do the conversion thing with the Dwarves, but the other players wouldn’t have it. It’s difficult to convert people when each race has their own living god (Drolfo, Navillus, Izquitl, and The Books). 36 NA: Without definite proof of the demonic presence in the Upper Maw the Merfolk refused to form an offensive alliance with the Dwarves against the Humans. The Dwarves asked that a commission of Merfolk be sent along with the Dwarven missionaries to the lands of the Najar. There, the people of the sea would see the threat that loomed in the North. 40 NA: Now that the people of Bwolark had settled themselves on the newly christened, Bwolo Isle, the Merfolk decided to intervene. The fish-men demanded tribute in rice from the Humans on their island. Just as Bwolark had spat at the offer of Navillus the Black Prince, the Bwarlor rejected the random demands for foreign crops by the Merfolk. 50 NA: After years of trying, shaky diplomatic relations were finally established between the Dwarves and the Avians. Unfortunately, the Avians rejected the Dwarven offer to arbitrate peace between the Avians and the Merfolk. Since the death of Trebor the Avians lacked true central leadership. While the Prophets of Cui-Xoloc were recognized as the Avian rulers, they held little real power. Generals, sages, princes and prophets seemed a dime a dozen, each vying for control of the Hrududu. The Avians were too proud to accept the humiliating terms of the Merfolk. They could not let their people’s spilled blood go unpunished and yet… they lacked united leadership and the military discipline to formulate an attack. They posed little threat to the Merfolk, beyond the occasional raid on Tortuga. With each passing decade their attacks became less ferocious, smaller, and more content to merely pilfer outlying farms and villages. 52 NA: The Dwarven missionaries, after failure at Rontu-Aru, took the Merfolk embassy to the port city of Alixria. The Dwarves reminded the Merfolk of the worldwide earthquake many years ago. The Dwarven sages believed the quake was some sort of demonic presence entering the world and corrupting the Humans. The Dwarves showed as much of the Human devil worship as they could manage without endangering themselves. Unfortunately, the Najar were good at hiding their villainy. The Merfolk rejected the alliance offer, seeing no danger in the Najaran Empire’s existence. The Dwarves went home, defeated before any battles had even taken place. Without any allies they had no hope of winning a war against the Humans. 67 NA: The wraith-like race of Grez emerged in the cold reaches of Glacierstone. Who knows how long they had been there, biding their time. 78 NA: The growth of the Halusho Forest manifested itself in new, mysterious ways. A new race came walking out of the trees, the Elves. 83 NA: The Elves quickly organized their civilization with their natural talents. They built a city around a giant oak in the forest, Crodolan. There the Elves created great works of art with wood from the Halusho and with metal mined from the Mandibles. 97 NA: Reesrevo, the god of winter and patron god of the Grez, guided his people as they established themselves in the new world. The Grez moved into the cold ocean between Glacierstone and the Upper Maw. They created Reesrevoton by freezing the ocean and making a giant glacial tower surrounded by a layer of ice under the command of their god. The Grez turned all of Glacierstone and parts of the northwestern Maw to ice. 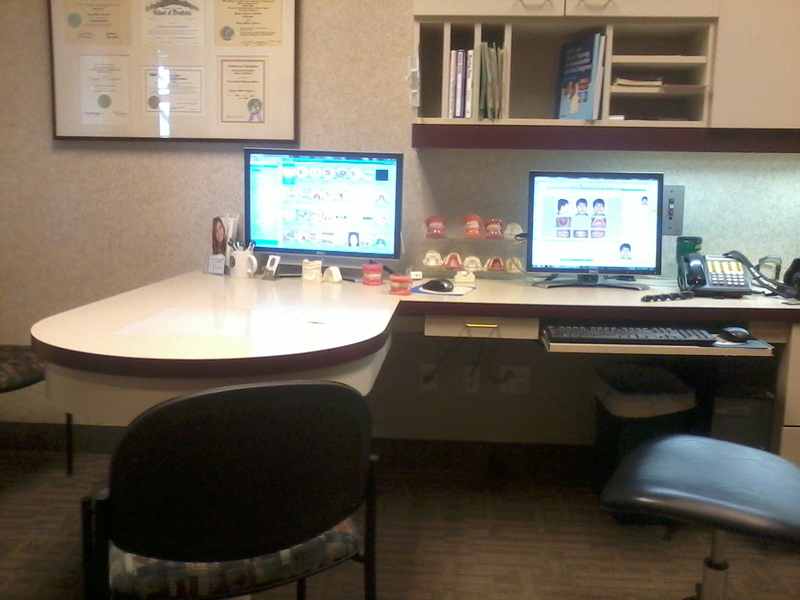 The office of the third orthodontist I’ve visited. I went to the orthodontist today for a third opinion on a procedure I’m considering. I have a crossbite where my lower jaw doesn’t line up correctly with my upper jaw. It’s not visible to other people unless I point it out and it doesn’t affect my eating. The issue is that the problem only developed recently and it irritates me. I feel like my mouth just doesn’t close right and I hate it. My mother had the same problem and it eventually became painful and she had to have surgery to get it fixed. I’ve gotten conflicting opinions on whether the jaw pain my mother experienced was related to her crossbite or to grinding her teeth, but I feel those two could be connected. I’m certainly grinding my teeth more now that they don’t fit together correctly. Fixing my crossbite would require surgery. I’ve been to three orthodontists and they all agree that I’ll need to see an oral surgeon in addition to getting braces to fix the problem. My family is worried about the surgery for practical reasons. The health benefit isn’t clear, its expensive, and no one will notice but me. Surgery also has possible risks of excessive bleeding when they take out a piece of my jaw so that the upper and lower halves match. That risk is controlled by doing the surgery in a hospital, but its still on my mind a little bit. I’m also concerned about whether I will enjoy the surgery once it is finished. My crossbite developed when I was about eighteen years old. The reason it bothers me is because I remember when it wasn’t like this. But if my teeth were always like this would I care? Probably not. And what if after the surgery my teeth don’t fit exactly like the way they used to? Then I would still feel like my mouth wasn’t closing right and I’d have spent thousands of dollars for nothing. I’ll keep doing the consultations and planning steps for the procedure for now, but I haven’t made a definite decision on if I’m going through with it or not yet. Bleh! Why can’t my dental problems just be candy related?